This wasp was collected outside my work. 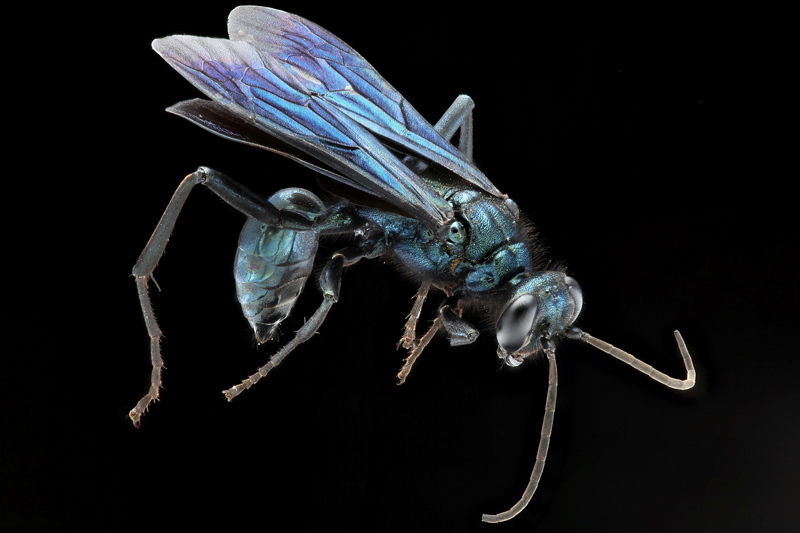 A Chalybion californicum, or "blue mud wasp". I have am drawn toward blues, greens, and purples in nature, and this critter has all three. Shot with canon 100mm macro, ISO 100, 1/125 @ f/8. 39 frames stacked with ZS Pmax with minor retouching. Amazing colours How do you cope with oof haloes when shooting on a black background , or do not they not appear for this depth/magnification of stack ? Thanks Andrew. For me, oof focus haloes are rarely a problem. I always use the black background and if I do see some problems, I do my best to get rid of them using the built in retouching in ZS. After that, I find that adjusting "curves" in photoshop, and using the clone stamp tool will take care of anything left behind. I am usually willing to take as much time as I need to make an image look as good as possible!